For ages 8+. This is a monthly 2 hour class with an instructor. This time is for sewing students to work on solo projects. Class price is for each two hour session. Advance purchase is strongly recommended as we expect these classes to fill quickly. This 3 session class will teach you how to sew! First Class will be intro to the machine, second and third classes will be fun beginner projects. Perfect for Mothers Day. This class price is for 2 class participants!! choose 1,2, or 3 fabrics to make a pillow cover complete with piping! 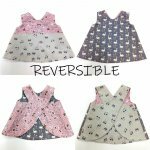 Sew a Reversible Baby Dress with one yard of fabric. No buttons or zippers, all hidden seams makes this a fool proof gift! 5 mornings for a week for your kiddo to sew a variety of projects!